15 Nostalgic Retro Toys in this Classic Toys and Games Gift Set - Army Men, Slinky, Slide Whistle, Cap Bomb, Paddle Ball, 15 Puzzle, Lunar Launch Toy Gun, Jacks, Jet Fire Toy Plane, Silly Putty and much more! Consult the Magic 8 Ball for loads of fun. 20 possible answers. Perfect for party favors and stocking stuffers, this Display Box of 36 Pinky Balls means you'll have enough to give one to everybody. The Radio Flyer Tetro Rocket Ride-On offers a playtime adventure that is surely out of this world! This foot-to-floor ride-on toy features a classic rocket design. It includes realistic astronaut and space sounds, and a clicking nose cone to spark your child's imagination. The underseat storage compartment allows your child to store their favorite treasures. Blast-off into galactic, space age fun with the Radio Flyer Retro Rocket Ride-On! Look who's back. Snoopy Sniffer! Snoop N Sniff is a pull-along pup that kids love. Retro look and feel like you remember. Order yours today! Look who's back. Snoopy Sniffer! Introduced in 1938 as "Snoopy Sniffer," this charming pull-along pup found a home with over five million families. 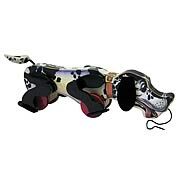 Now, the long, black-and-white hound is being reintroduced for a whole new generation of kids to enjoy! And it's got that retro look and feel, just like you remember. Order yours today! 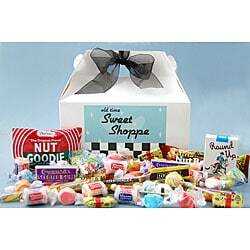 *Gift filled with nostalgic candy brings its recipient back to the days when they were a kid *Retro-themed gift box contains two pounds of great old fashioned candy *Food basket includes Mary Jane&apos;s, Nut Goodie Bar, Salt Water Taffy, Necco candy, Lemonheads, C. Howard&apos;s gum, Slo Poke&apos;s, Candy Cigarettes and more Personalized Gift Messaging is available at Check-out for this particular item. Due to the perishable nature of these items, returns are not accepted by state law. Authentic 1920's style with the technology of today! Our Crosley Bandmaster Stack-O-Matic features a handsome, beautifully crafted wooden cabinet with record player, AM/FM radio, and front-loading CD player. Spin your sentimental oldies and the kids' favorites too. Best of all, it includes one Stack Mate -- a $29.95 value -- so you can stack up to six 33 1/3, 45, or 78 RPM vinyl records. Enjoy superior craftsmanship and sound with delightful vintage flair! Invented in 1916 by John Lloyd Wright, the son of legendary architect, Frank Lloyd Wright, these are the classic Lincoln Logs that have engaged generations of budding architects and builders in creative play. While watching the construction of the Imperial Hotel in Tokyo, John realized that he could incorporate the same "floating cantilever construction" into a toy that would spark a child's interest in architecture. Just like his father's hotel, Lincoln Logs rely on a system of interlocking beams rather than screws and nails. Our retro-riffic inflatable Bozo Bop Bag dates back to 1965 yet remains a knockout with today's active and energetic children. With bright red 3-D hair and squeaky nose, a targeted bop zone, and a sand-filled base for bounce-back action, Bozo's ready for fun! Inflates with any standard air pump or use our handy Electric Air Pump (see Item #5348), sold separately. The original retro pogo stick in wood is great for creating a true wholesome and old-fashioned fun pogo jumping experience! The precision-made wood and metal used will allow for this pogo stick to last for years to come. Time jumps forward with the original retro pogo stick in wood. Test your skill with our ultimate Marble Set! Perfect for travel, the vintage set includes a 16" x 16" mat, wooden bridgeboard, wooden shooter, and 20 multi-colored glass marbles featuring shooters and mibs. A cloth marble pouch and history guidebook complete the game. Make friends with Patti! Standing nearly 3 feet tall, Patti Playpal, the most popular companion doll from the early 60's returns to delight a new generation. The wonderfully detailed doll's arms and legs move, head tilts for life-like poses, and hair is rooted for styling and brushing. Patti also has pretty-in-pink fingernails and toenails, blushing cheeks, rosy knees, and bright blue eyes that close when she lies down. This limited edition comes with numbered certificate of authenticity. Also available as a Brunette (see Item #8032), sold separately. Huggable, lovable, and historical! This cherished retro friend dates back to the 1940's and 50's, when folks made dolls and toys from real red heeled work socks. Our replica Sock Monkey Doll is crafted in that wonderful tradition. Bring back memories of yesteryear and help build young imaginations and creativity with this neat sock toy. Fun for kids and adults! Kids love riding this catalog exclusive replica of the original "Irish Mail" row cart from 1930. The push-pull motion of our Classic Wood Row Cart propels riders forward or backwards as they steer with their feet. Rubber treads ensure a smooth ride. Strengthens critical motor skills while building stamina and coordination. A nostalgic good time with benefits! First sold in 1960, today it's as easy as ever to make the creepiest crawlers imaginable! Just squeeze the special goop into the molds, then heat in the child-safe oven. In approximately 10 minutes, a wiggly army of bugs is at your command! Kit includes oven, 2 molds which create 5 bugs each, 4 bottles of goop, cooling tray, mold handler, and other accessories. Extra bottles of plasti-goop and mold packs are sold separately so you can keep the creepy fun going strong! All aboard for pedal adventure! For over 100 years, the Lionel name has stood for quality. Their wonderful Pedal Train includes all-steel construction, adjustable pedals, chrome bell, realistic locomotive sounds, padded seat, and a beautiful finish. Kids pedal their way to a good old time filled with imaginative role play! For more train fun, add our Train Engineer Outfit (see Items #5891 and #5892), sold separately. This is the classic Flying Turtle children's scooter from the 1970s that uses the undulating movement of the handlebars to provide forward motion (Play Video). First developed by an aerospace engineer, the scooter eventually found its way into amusement parks, preschools, and homes. Supporting riders up to 150 lbs., the scooter moves forward when the handlebars are pulled from side to side (with one's feet on the crossbar). Four smooth-rolling skateboard wheels with sealed bearings allow it to be ridden on any smooth surface, including driveways, sidewalks, and patios. The Realistic Digital Slot Car Raceway. This is the 1:32 scale slot car raceway that employs digital technology to create the most realistic racing environment available. Unlike its analog predecessors, this set considers fuel consumption, braking responsiveness, and pit rules. Each of the three included cars is equipped with a digital microchip that allows you to change lanes or pull in to pit row--do so too fast, and your car may be penalized a lap. A display shows you how much "fuel" you have, and if you fill your car to its maximum, its top-speed will be slower to account for the "weight" of the fuel, but it will go farther. The Route 66 Gumball Machine. A nostalgic reminder of the friendly service stations that dotted the landscape along the legendary Route 66, this chrome-trimmed gumball machine is a full-scale replica of a 1950s-era gas pump. It has a lighted glass globe, gas hose, and nozzle. Holds approximately 3,500 gumballs (not included).